from Eastern TIBET and Northern Yunnan, CHINA. 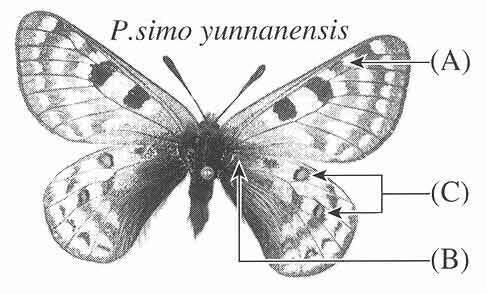 CHINA as follows: Parnassius simo demolensis, Parnassius simo yunnanensis. Keywords : Papilionidae, Parnassius, new subspecies, TIBET. Yunnan, CHINA, taxonomy. Parnassius simo yunnanensis KAWASAKI ssp.nov. 6 males, 6 females S. of Deqen, Baima Pass alt.4600m, 26 Jun.1998 Leg A. Gorodinski. Fore wing length, 19mm ~~ 24mm, smaller than ssp.lenzeni and ssp.fickleri. Ground colour is yellowish cream. Red ocellus in cell 8 of fore wing is absent in almost speciments, while in ssp.fickleri it is well developed. Marginal black band and submarginal black spots series of hind wing are well developed. Basal black scales of hind wing are very well developed. Red ocelli in cells 5 and 7 of hind wing are smaller than those of neighbouring subspecies. Basal red ocellus on underside of hind wing is absent in almost speciments, on the other hand, in ssp.fickleri it is usually well developed. I would like to express special thanks to following persons for their kindness and support. P.andreji, with the description of new ssp.of andreji:Gekkan-Mushi No.297,8 ~ 13. Weiss,J.C.,1991. The Parnassiinae of the World PartI, 11 - 18. Brk,F.,1935. Das Tierreich Parnassiinae pars 11, 654 ~- 673. Omoto,K.& Kawasaki,Y,. 1998. Some new parnassiinae butterflies from Nepal in the Haruta-collection: Trans, lepid. Soc. Japan 49(3), 147 ~ 155.